We offer a large range of card based machines from manufatures such as Amano, Seiko and MAX. 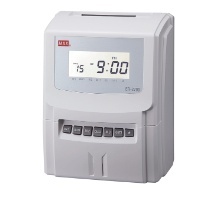 Starting at the basic models which have no calculation and a weekly clock card, the other option is to have a card based calculating clock which is the step in between a PC based system and can cater for upto 60 employees. These clocks can give you either a daily total or a daily total and either a weekly/bi-weekly or monthly accumulation depending on model.